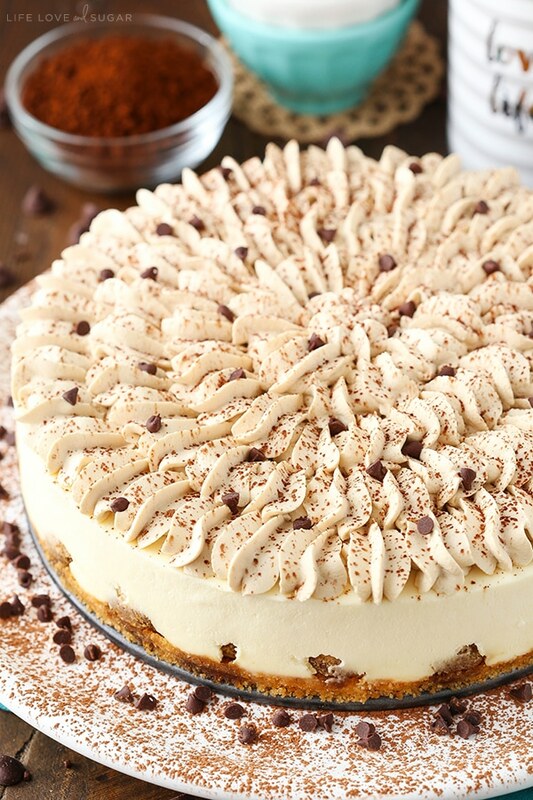 This Tiramisu Cheesecake is super easy to make and tastes just like tiramisu! 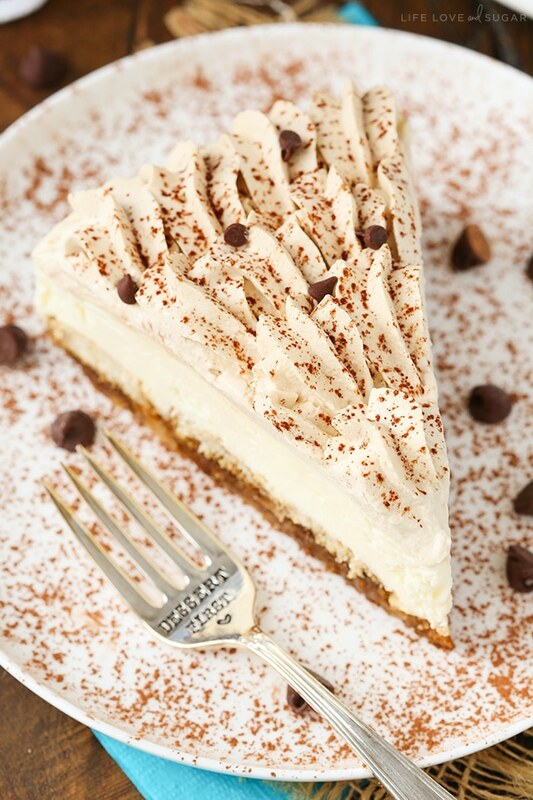 The combination of espresso, Kahlua and mascarpone cheese is to die for! 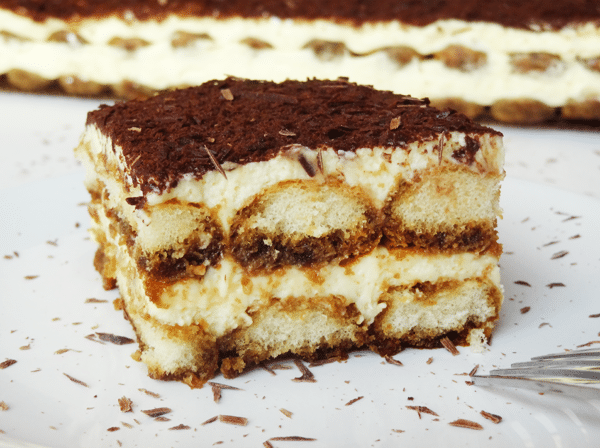 So you may or may not have noticed that I love my tiramisu. 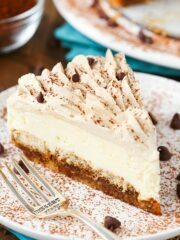 I have a recipe for traditional tiramisu, tiramisu cupcakes, a brookie tiramisu, a pumpkin tiramisu layer cake and now this cheesecake. 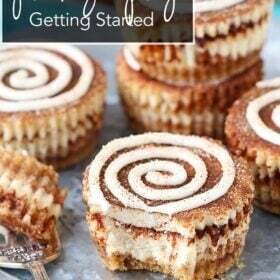 I even have a tiramisu related recipe in the cookbook! I fully intend to tiramisu all the things. 🙂 It’s just so good! And I had a lot of fun putting this cheesecake together. 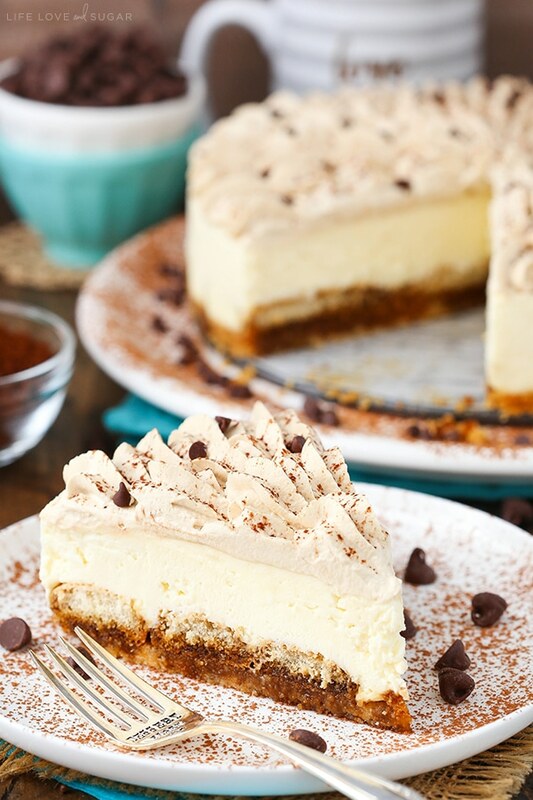 Initially, I wanted it to be a fully baked cheesecake but it wasn’t turning out quite like I wanted so I switched gears and went with this almost no bake version. The small amount of baking comes in the form of the crust and while I would normally say that you could forgo the baking I really do think it’s necessary in this case. Initially I made the crust with crushed up ladyfingers. It makes sense, right? But when you grind up ladyfingers they are quite soft and very light. I didn’t feel like it resulted in the firmer crust I wanted. So instead I went with vanilla wafer cookies. The flavor is still great (one of my favorite crusts) and it did bake into a nicer crust. And as I said, the baking really is necessary. 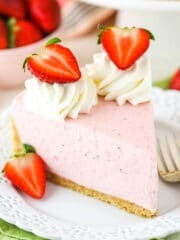 Baking a crust helps it hold together better when you cut into it later and for this cheesecake I really recommend it. The crust is topped with ladyfingers that are dipped in Kahlúa and espresso and some of the liquid soaks into the crust while firming up in the fridge. It softens the crust a bit so if you don’t bake it to begin with it’ll be even softer. On top of the the crust, you have the ladyfingers which are dipped in espresso and Kahlúa. If you would prefer this cheesecake to be non-alcoholic you could leave out the Kahlúa and add additional water and espresso, but I always love the flavor of the Kahlúa. Next is the mascarpone and cream cheese filling. 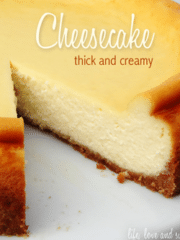 I used a mixture of both cheeses to help with the firmness and texture of the cheesecake. Mascarpone has a tendency to be a little softer so the cream cheese helps balance it out and keep it a little firmer and less fussy. It still has that signature macarpone flavor that I totally love though! To finish off the cheesecake, I used a Kahlúa and espresso whipped cream. I used what was left of the Kahlúa mixture that I dipped the ladyfingers into, but if you don’t have any left you can make a little more. 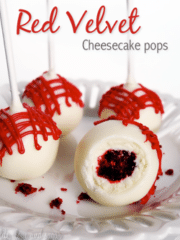 The whipped cream is piped onto the cheesecake using the Ateco 808 piping tip. Starting from the outside, you pipe shells in several full circles all the way around the cheesecake and in to the center. A sprinkle of cocoa powder finishes it off perfectly! The hardest part of making this cheesecake is waiting for it to firm up! I couldn’t wait to dig in and it definitely didn’t disappoint. 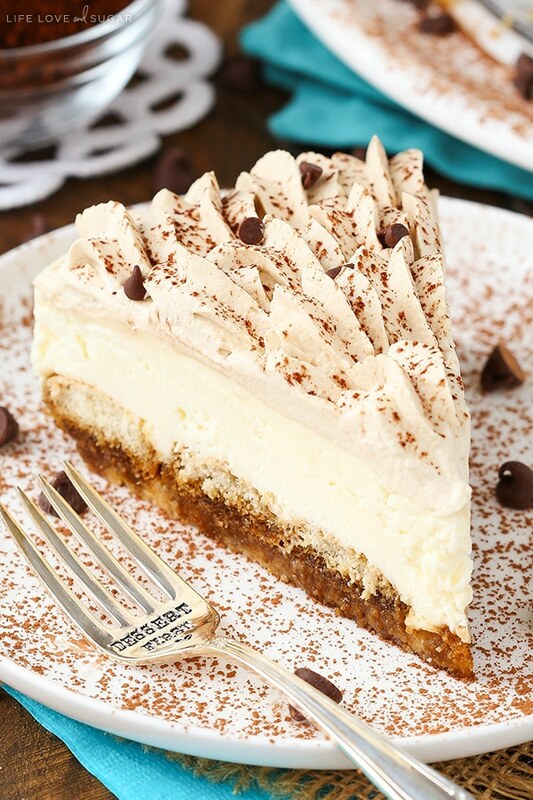 All my tiramisu dreams came true in the form of this cheesecake! So good! 2. Mix together the crust ingredients until well combined and press the mixture into the bottom of the springform pan. 1. 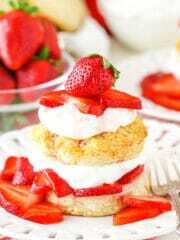 To make the filling, mix the cream cheese, mascarpone cheese and sugar together on medium-low speed until combined. Do not mix on high speed or overmix or the mascarpone cheese can begin to separate. Set aside. 2. In another mixing bowl, add the heavy whipping cream, powdered sugar and vanilla extract. Whip on high speed until stiff peaks form. 3. Slowly fold the whipped cream into the mascarpone cheese mixture. Set aside. 4. Combine the warm water and espresso powder for the Kahlua mixture in a small bowl. Add the Kahlua and stir to combine. 5. Dip the ladyfingers into the Kahlua mixture one at a time, then add to the springform pan, on top of the crust. 6. Spread the mascarpone cheese mixture evenly over the ladyfingers. 7. Set the cheesecake in the refrigerator to chill and firm, 5-6 hours or overnight. Set remaining Kahlua mixture in the fridge for later. 8. When the cheesecake is firm, make the Kahlua whipped cream. Add the heavy whipping cream, 1/4 cup of the remaining Kahlua mixture and powdered sugar to a large mixer bowl. Whip on high speed until stiff peaks form. 9. Carefully remove the cheesecake from the springform pan and use an offset spatula to smooth the sides, if needed. 10. Add the Kahlua whipped cream to the top of the cheesecake. You can simply spread it on top or pipe it in a similar pattern as I did. I used the Ateco 844 tip. 11. Sprinkle a little cocoa over the top of the cheesecake, if desired. 12. 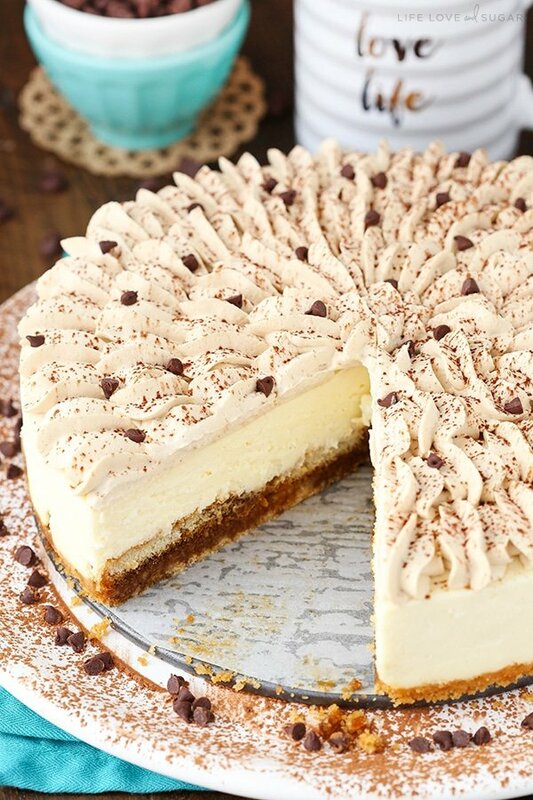 Refrigerate the cheesecake until ready to serve. 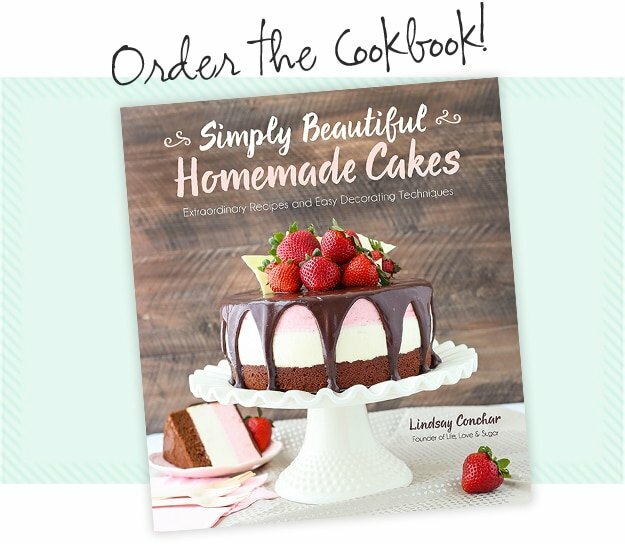 Hi LIndsay… I pre-ordered your book; can’t wait for it to arrive! 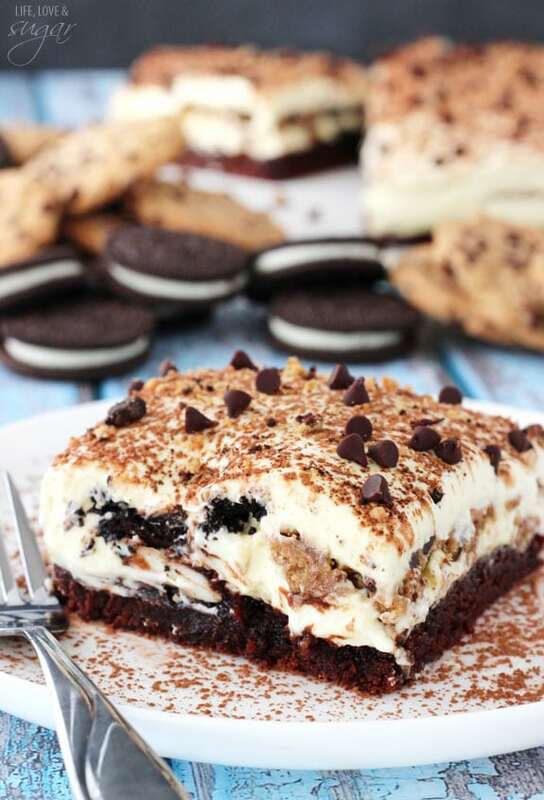 I am breaking one of my cardinal rules here, by commenting on a recipe before I actually try it, but I must thank you for coming up with an almost no-bake tiramisu cheesecake! I love tiramisu and cheesecake, but when I tried another blogger’s recipe for it, the results were almost comedic, in that the ladyfingers floated to the top of the cheesecake batter while it was baking in the oven. Imagine my surprise when I opened the oven door! Your recipe comes with perfect timing too; my family is celebrating both my parents’ birthdays this weekend and my dad is an avid cheesecake fan. Will definitely be giving this recipe a go. Thanks again! Oh, I hope you love the book Sharon! Hopefully it’ll get to you Tuesday! This just might need to be my Thanksgiving dessert! Looks amazing! I definitely think it should be. 😉 Thanks Debbie! I hope you enjoy it if you give it a try! Oh Lindsay, going to be on my Christmas Eve menu for sure! Just looks wonderful. Thanks Marilyn! 🙂 I hope you enjoy it! What can I substitute lady fingers with? That really is what you’re going to want to use. Nothing else will really give the same result. Do we really have to use alcohol here? You certainly don’t have to, I just prefer the Kahlua. I mentioned in the post that you can replace it with additional water and espresso. Feedback? Is this okay to take up your space? I LOVE that you give us the details of your investigative work! 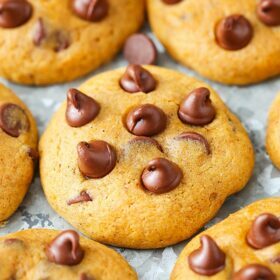 Cooks/bakers naturally come up with ideas or little adjustments they might make to a recipe, so it is a huge help when the developer tells you up front what not to do. Don’t try this, it doesn’t work. This ingredient is gross. It will cook too fast in this size pan. Etc. I say this because I immediately thought I would have used a lady finger crust. But it’s too soft! You already found out! So, thank you for letting us in on the nitty gritty. Wow, the frosting on top turned out so pretty! And the cheesecake sounds delicious! This looks delish and I am definitely making for thanksgiving! Can it be made the night before or would the whipped cream on top be better the day you serve it? Sorry for the delay is response. For future reference, this can definitely be made a day ahead. The whipped cream is a stable one, so it’ll be fine. Made this for Thanksgiving dessert tonight, and it was BOMB. Holy moly was this good! I did add a thin layer of dark chocolate ganache over the cheese layer (under the whipped cream), which gave it a great complexity and elegance. The crust was crunchy and soft, just as mentioned, and the Kahlua-espresso whipped cream was heavenly. I made extra of the whipped cream, since I decided to pipe it on the cheesecake and wasn’t confidant that I would pipe it effectively enough to cover the entire cake, but the amount in the recipe turned out to be plenty. Gave my sister the extra whipped cream and took a picture of her eating it from a huge serving spoon (she thinks the whipped cream is to die for, and is wonderful all by itself). I’ve been following this blog for a while now, and this is actually the first recipe I’ve tried. I’m buying the book. My Italian cousin posted this on FB and I pinned it to my boards. I am not big on “flavored cheesecake” but this sounded wonderful so I made it for thanksgiving. it was truly amazing and an HUGE hit! my nephew, who LOVES Tiramisu thought he died and went to heaven! Thanks so much for a great recipe! this is a keeper! Wonderful! 🙂 I’m so glad it was such a hit! Made this for my birthday, it is exceptional! Definitely will be making again. Wonderful! 🙂 I’m so glad you enjoyed it! How long does this last in fridge after making? I leave Friday for the family Christmas I want to make it now due to my busy schedule but will it last? I’d say it’s best for 2-3 days. Awesome recipe! Thank you. I made it and it’s so easy and decadent. I wish I could attach a picture of my result. Sorry to tell you. I tried the recipe for tiramisu cheesecake over the weekend and we thought it tasted terrible. Did you happen to make any adjustments to the recipe? Do you think it will still be ok if I used 16oz of cream cheese and only 8 oz of marscarpone? Sure, it’ll turn out fine. It won’t won’t have as strong of a mascarpone flavor. Hi! This looks amazing! Can u tell me what brand of vanilla wafer cookies you used? And also, what can I substitute Kahlua? Bcoz I dont consume alcohol ???? Thank you!! 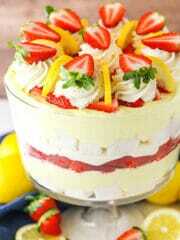 Will surely make this soon. More power to your blog! Lindsay , I would !I’ve to make your tiramisu cheese cake for church potluck , would you have a recipe for non alcoholic kalua. Thank you for any help. Please see the note I added to the recipe for a non-alcoholic version. Thanks! Sorry for the delay in response. I’m so glad to hear you’ve enjoyed the book! If you still need some recommendations, please let me know. Hi Lindsay! Could I use fresh brewed espresso rather than the espresso powder and hot water? I’m planning on making this for Easter dinner. Thanks in advance for your advice! It wouldn’t hurt it, I just like to use the powder and water because I can control how strong it is (I make it stronger). Thanks for responding! I actually went out and bought espresso powder, yesterday. I’m definitely wanting a stronger espresso flavor, so I’m glad I did! I’ll let you know how it turns out. Happy Easter! What would you recommend for an alternative to marscapone? I can’t seem to find it in the grocery stores. I was able to get the lady fingers on Amazon. You could use cream cheese. It won’t have quite the same flavor, but it’ll be fine. I’ve made this twice now and it’s delicious. I had trouble finding traditional lady fingers the second time, but came across a substitute that we actually liked better. My local store didn’t have fresh lady fingers in the bakery but they had lady finger biscotti cookies in the international food aisle. These are slightly crispy with a light sprinkling of sugar on top. They held up better in the cheesecake because of the crispness but the flavor was exactly the same. My sister had also just brought me chocolate-covered coffee beans from Costa Rica so these made an extra special garnish. The Kahlua whipped cream is ridiculously good. Thank you for the recipe — it was an immediate favorite. Hi, I read the above comment about the lady fingers, but still wondering what you think works best in this recipe. The hard lady fingers or the soft ones. Is there a brand you prefer? If using the harder ones I’m wondering if they soften up enough. Thx! When you say icing, do you mean the whipped cream on top? 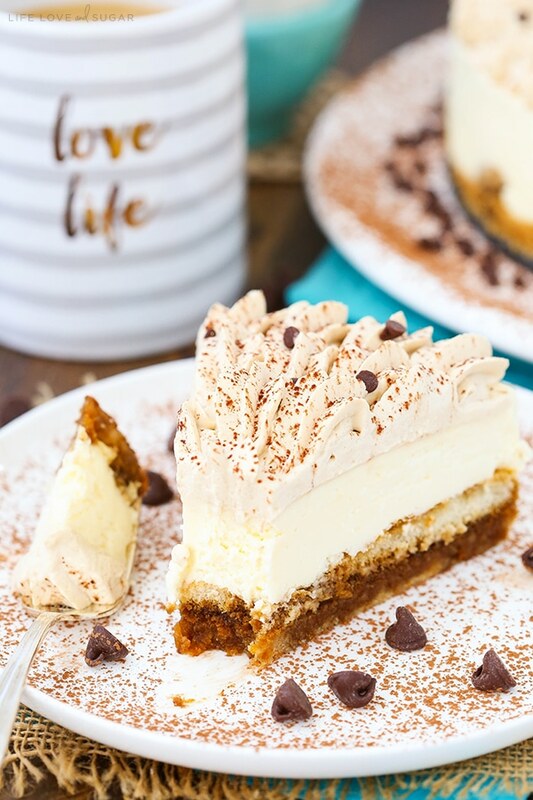 You don’t want to over mix the cheesecake filling with the mascarpone cheese, but the whipped cream – go ahead and whip it like crazy until it’s stiff. If you still have trouble, just reduce the amount of coffee/espresso you add. Can you please tell me if you are using the soft lady fingers or the hard biscuit type? thank you! I used the firm lady fingers. This recipe was fantastic! The flavors were amazing and it was simple to make. I will absolutely be making this again! Thank you!! Does this freeze well if properly wrapped or vacuum sealed? Not totally sure without trying, but would think it’d be ok.
Hey is there any substitute for Kahlua? 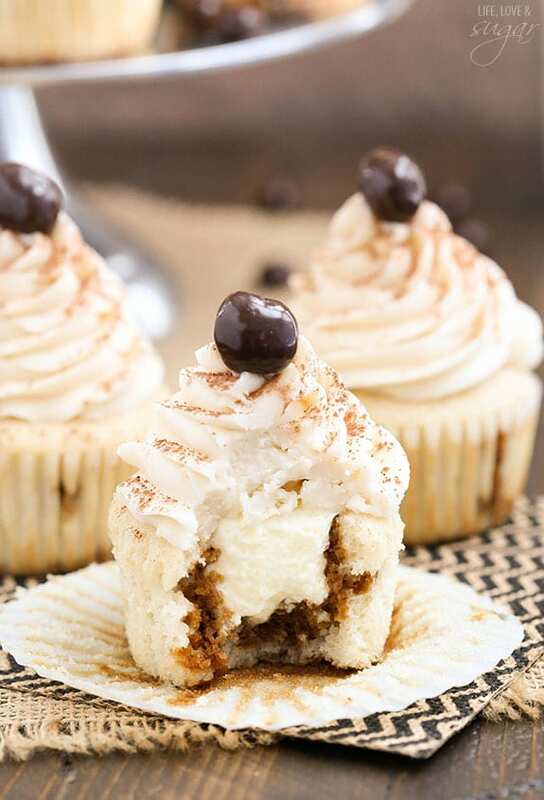 Also for the tiramisu cupcakes? Here’s a substitute you can try. Adjust the amounts as needed for the different recipes. Hi. I would love to try this recipe but I hesitate. Why? You ask. Because I tried another recipe with mascarpone and it was great. Then after a couple months I tried it again. The recipe says “room temperature ” for the mascarpone so I left it out on the countertop . It still felt cool to the touch but I used it. It separated curtled . 32oz of marscapone went down the garbage disposal. So how do I prevent this? I believe the first time I made it I didn’t realize it should be room temp and I used it right out of the frig and all was well. Please let me know your method of using mars alone in your recipe as I would love to try it without fear of wasting all the ingredience because the mascarpone. Mascarpone can certainly be tricky to work with. And “room temperature” can even vary based on how warm or cool you keep your home and the time of year. That said, as long as the mascarpone is workable, you can use it will it’s still cool. That might even be better so that you’re sure it’s not too warm, which can cause issues sometimes. The main thing is you want it soft enough to not leave you with chunks in your cheesecake. The other thing is mixing. Mascarpone is very sensitive to over mixing and doesn’t come back well once over mixed. I believe combining it with the cream cheese is the only time it’s really mixed in this recipe. As long as it’s soft enough to combine quickly and easily without leaving chunks, you shouldn’t need to over mix it. The rest is just folding in the whipped cream, which should be fine and gentle on the cheese. I hope that helps! Have you tried Marsala instead of vanilla in the filling? 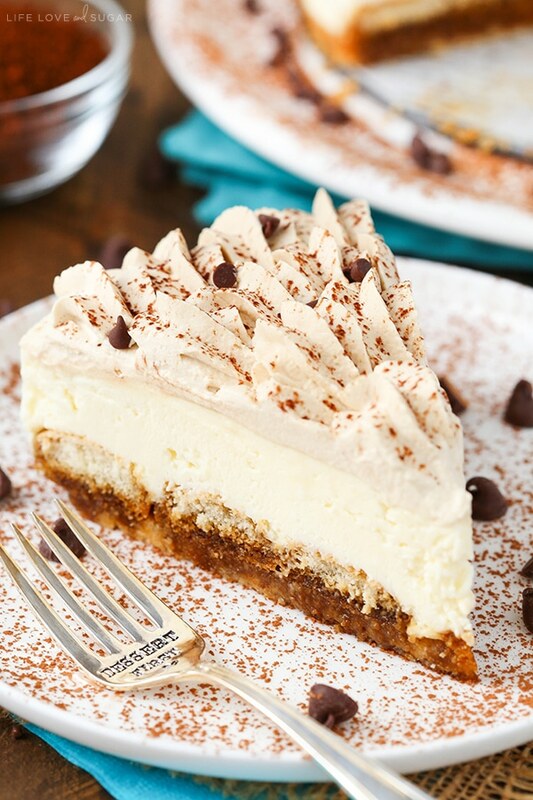 Your tiramisu cheesecake looks Devine . Please wish me luck I am away to make one this weekend. A practice for Christmas well that’s my excuse anyway can’t wait to make then try it. This turned out amazing. Everyone loved this cake and we devoured the whole thing with friends this Xmas. I did not quite match your piping skills but it still looked impressive. The ladyfingers could have been a bit more soaked so next time i would make sure to submerge them for a few seconds; I just dipped them into it quickly. The Kahlua whipped cream was a bit too sweet for me so I would go for half the powdered sugar in the future. I added a bit of Whipit stabilizer and it stayed in perfect shape during our long car ride. Thanks much for making my Xmas dessert such a hit! This was soooo good. I made it with gluten free lady fingers that I ordered on Amazon and made sure to soak them in the espresso/kahlua. I subbed them for the vanilla wafers in the crust too and it turned out great. I may try a second layer of lady fingers in the middle of the marscapone layer next time to cut the richness a little. Thanks for this delicious recipe! I’m so glad you’ve enjoyed the recipes! Please see the note at the bottom of the recipe for how to swap out the Kahlua for additional espresso. Hopefully that helps! Thanks for sharing! Can I make it very far ahead of time? 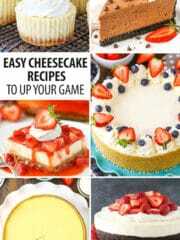 The cheesecake would be good for 3-4 days after making. This looks incredible! I love the decorating too. Any tips for piping the icing well? What kind of instant espresso powder do you use, and where do you get it? This is the one I use and I just get it at the grocery store. I made this over the weekend for a friend’s birthday. It turned out amazing! Great flavor, great recipe. Thank you! So glad to hear that! Thanks Dawn! I made this for a luncheon yesterday, and it was delicious. Everyone said it was better than any they had ordered in a restaurant. I agree. 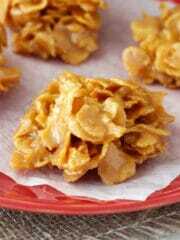 I always made one that required 5 containers of marscopone which was costly to make. This recipe was easy to make. I did need 18 lady fingers to fill the bottom. I also reduced the Kahlua to 1/2 cup and the amount was perfect even with the added ladyfingers. The taste was not compromised. The whipped cream on the top did not get as stiff as the added whipped cream, but that was because of the kahluah mixture. I didn’t think there would be enough to cream for the top, but it was the perfect amount. . I piped it with a Wilton 47 and zigzagged It as I was drawing it from the middle. It was beautiful. I also added cocoa and mini chocolate chips. I was even able to remove the spring form bottom before slipping it on the plate. I shared this recipe with my group today because everyone requested it.. Thank you. Wonderful! So glad to hear you enjoyed it! 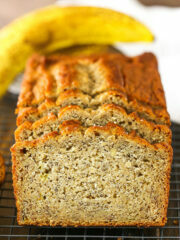 These translated beautifully into 24 cupcake-sized servings! YUM, thanks! I made this to take to my parents house for Father’s day and everyone loved it! It looked so fancy and tasted amazing. Thank you for a terrific recipe! Lindsay, Is there any substitute for the expresso? Thank you. Are you wanting to use the Kahlua, but not the espresso? Is it the caffeine? Just curious because it affect my suggestions. If it is, could you use a decaf espresso or coffee? I made this twice in two weeks. Once for work using khalua and the second time without alcohol using espresso. 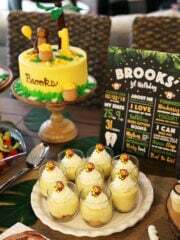 It was a huge hit each time with comments like “this is the best dessert I’ve ever had”. I added some vanilla to the espresso mixture the second time to give it more khalua flavour. I am making it again in two days by request from someone who had it the first time. Thanks so much for a great recipe! That’s wonderful to hear! So glad you’ve enjoyed it! 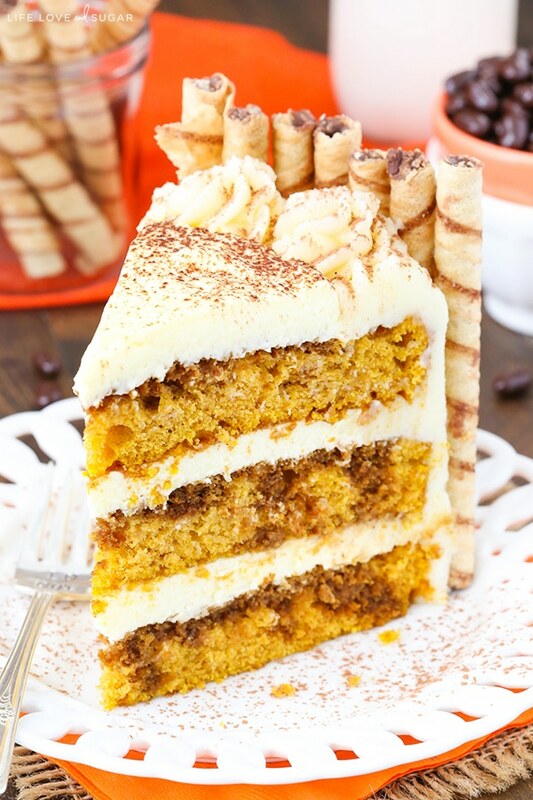 I plan to make this next week, and was wondering, how long can I refrigerate after adding the whipped cream topping? Could I make the whole thing a day earlier and store it in the fridge? Yes, you can make it a day ahead and store in the fridge. The whipped cream should not wilt as long as you used the full amount of powdered sugar it calls for since the powdered sugar is what stabilizes it. I hope you enjoy! I made this as a trial run for a dessert auction and it was a hit with everyone I shared it with. Everyone raved about it. It was light and airy and DELICIOUS. It was one of the highest winning bids at the dessert auction. I am making it again for the next auction. This turned out very well! I had enough ladyfingers for two layers, so added another layer between the cheese filling. Between that and the Kalhua whipped cream it was a pretty boozy cake! But that was not a problem for the dinner I made it for. If I want to take this to work with the same double layer, I will probably reduce the Kalhua in the soaking liquid. That’s awesome! I’m so glad you all enjoyed! Made this for a friend gathering and it was a huge hit! There was nothing left to bring home. After reading through everything, I was really nervous about ruining the mascarpone cheese, as I have never made anything with this before, so I dont know that i let it get quite to room temperature like I did the regular cream cheese, but it all blended together nicely since the mascarpone is so smooth and creamy. I dont think enough of my kahlua mixture soaked through to the crust from the lady fingers, because the crust just kind of fell off when you sliced it. Next time, i may soak them a second longer. I will definitely be making this again! Thanks! Wonderful! I’m so glad you it worked out! 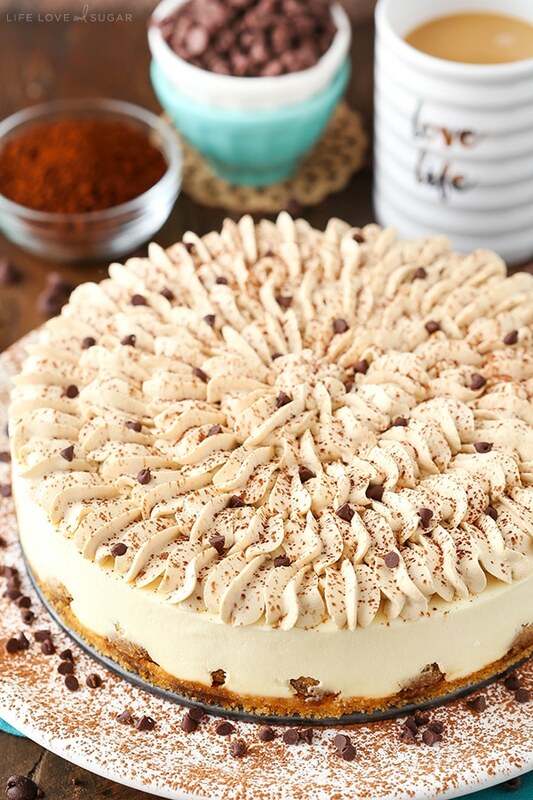 just curious… what happened when you tried to bake your tiramisu cheesecake? did it mess up the texture? It’s been so long, I don’t really remember. I don’t think I was able to get the crust the way I wanted it. Made this for dinner with friends. It was awesome! I was worried about the Kailua being too strong, but it was so yummy. This is not a thick, heavy cheesecake. It’s very creamy. Dessert got raves, so I will definitely be making this again! Thank you! Awesome! 🙂 So glad it was a hit! Also the frosting keeps melting . I added coffee from gas station instead of kahlua in the cake and also in the frosting . So will that ruin my cake ?? This recipe looks great 🙂 I’m wondering if I can use baileys instead of Kahlua?